…and I have it on good authority that Chess will continue to be played in 2011. So, it’s almost the end of the year. A good time for celebration, reflection, and goal setting for the next year. While my first rated game came in December of 2009, it was close enough to say that I really began serious tournament play this year. While the vast majority of those were at my home club, I traveled to: Bloomington once (an open not TCCC sponsored,) Peoria twice (GPCF Winter Tornado and Bradley Open,) LaSalle/Peru once, and DeKalb once. Passed my Local TD exam, a goal of mine made in 2009. I had a win against a player in the 1100 rating range, and I have a very solid win record against other players in my current rating range. (Which makes me think I’m a little underrated… but who doesn’t feel like that? ) Many of my other games in the sub-1500 range have been pretty close. I’m feeling much better about my middlegames, and I can see where I’ve strengthened as a player in the last year. My skill at defense has also continued to improve. I’ve developed the webpages for our club, and it’s now at a point of adding content and maintaining as opposed to developing. That’s a lot to celebrate!!!!! Take advantage of an offer to receive lessons. My last 12 months of rated play show a 29.7% win rate. I’d like to improve that to at least 33%. In the next year, I’m playing at DeKalb in January. I’d like to play in next year’s Bradley Open. 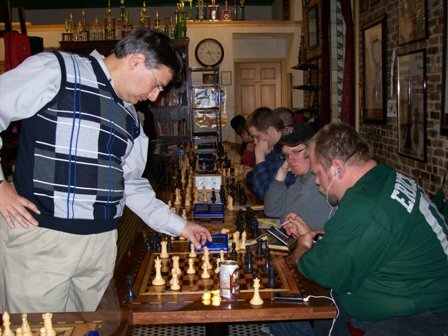 Of the following four places, I’d like to play in at least two of them and as many as possible: Chicago (preferably North Shore Chess Center,) Freeport, Springfield, Decatur, St. Louis Chess Center. I’d like to attend a day of the U.S. Championship again in 2011. If there is an open blitz event as well, as last year, this could provide the St. Louis playing opportunity. Possibly meet the other club members on one day, stay overnight, watch the second day and play in the blitz event. Work towards getting the directing requirements to become a Senior TD. No, not this Return of the King! Well, Vanity, thy name is LaughingVulcan! Monday was our usual club night, and we had ten people turn out to play Round 2 of the monthly G/60 tournament. I found myself paired against Nathaniel. But this time it was rated, rather than unrated. An epic clash of the Titans! I lead out the Giuoco Pianissimo again – for a second I thought about using the Bishop’s Opening (e4 e5 Bc4,) thinking I could transition that over to an Italian – another member in the club has been leading that opening recently. But… in the end, I decided to keep to something I think I know better. Instead of lightning striking twice, Nathaniel played his usual excellent game, and I ended up binding myself. As I was trying to command the d-file, plus either get the Queens off the board or getting a tactical shot in, Nathaniel got my a-pawn with his Bishop, and could then retreat the Bishop with a discovery on my Rook that had to be responded to. I’m not sure that trading Rooks was the right thing to do following that… But I also haven’t really done any analysis on the game at all, yet. That will come in the next few days, I hope. BTW, advice for other lower-rated players… Don’t let a single loss get you down. It’s the long haul that counts. The joy can lie in finding opponents that give you challenging games – win or lose. And, I am hoping that eventually I’ll get my Revenge. I’ve been gearing up for my first experience organizing and being Chief TD of (what we hope will be!) a large scholastic tournament. Chris (who will run the computer room) and I have been working on it pretty steadily, with lots of good help from the club members. Last year I made up some Christmas Chess Filks and posted them on the USCF Forums. Now I am pleased to bring you this year’s new crop. I’m a little more proud of these this year, if one can actually have pride over filk. I am intending, time permitting, to record some of them on YouTube and post the actual audio version here. Enjoy, and enjoy your chess! Last Friday night it was a 3 round scholastic tournament and I was privileged to be one of the computer operators. On Saturday it was the simul with Dr. Turgut as a participant. On Monday it was club night. I only played the first round of the G/20 tournament – mostly because I was exhausted enough that I played just to fill a round. Today (and for the past several nights) it was working on what became a 33 player scholastic tournament that I was USCF Chief TD of today. And all throughout it I’ve had the last of my four correspondence tournament games to keep up with. And on Monday it’s Round 1 of our monthly G/60 at the club. But it’s a really good kind of exhausted – enjoying my chess. Dr. Tansel Turgut played fourteen of us, and with a pretty rare condition that each of the fourteen boards had a 60 minute per side clock with delay on it. (So each of us got up to a full hour on our side of the clock. Dr. Turgut got one hour on each of the fourteen boards, but the clocks were running on his move while he was at other boards.) He demonstrated what a Master can do – none of us managed to win against him, though three players were able to score draws. I did make a couple of serious errors earlier, but with the simultaneous nature of the game I think Dr. Tansel either did not see the errors or did not want to go sharply tactical at that moment. (He is playing 14 boards after all, and when I’ve simuled – and yes I have on a smaller scale – you tend to play much more conservatively and let your opponents make the first errors if they’re on my level or below.) But as of the photo moment, I am still doing pretty well. It is over the next three moves from 20 that I would go from drawn to probably losing, and then after move 26 or 27 into “definitely losing” territory. Entries (RSS) and Comments (RSS). 39 queries. 0.490 seconds.